Pork pies are one of the most satisfying things you can make in the kitchen – like building your own house or giving birth to your first baby. * I recommend going the whole hog (pun intended) and making the hot water pastry, pork jelly and filling yourself. This will take a while, but the result will be something you’re strangely proud of and is guaranteed to make you a picnic-pie-legend amongst your friends and family. This recipe is adapted from Dean Brettschneider’s excellent Melton Mowbray Style Pork Pies - with sage, thyme, anchovy essence and ground mace adding another flavour dimension. Sift the flour and salt into a large bowl, bring the lard and water to the boil in a small saucepan then mix with a wooden spoon until everything comes together as a rough dough. Knead for a few minutes, then form into 4 x 125g balls and 4 x 30g balls. Keep the remainder to patch any holes. Wrap with cling film and refrigerate overnight. For the jelly, put all of the ingredients except the gelatine in a large pot and cover with cold water. Bring to a boil, then reduce to a bare simmer. Cook for 3 hours, removing any scum that rises to the surface and top up the water so that everything remains covered. When finished, strain into a clean pan, discarding the solids, then boil until reduced to 500ml. Soak the gelatine in cold water for 5 minutes to soften, stir into the hot stock then leave to cool. Store in the fridge overnight. Chop half of the pork shoulder into 5mm cubes, then pulse chop the rest in a food processor with the pork belly until coarsely minced - if you have a very obliging butcher he may do this for you, although this quantity is too small for many industrial grinders. Add the remaining filling ingredients to the meat and mix well. Seasoning is vital to the end result, so be sure to measure the salt. Cover with cling film and refrigerate overnight. The following day, take the pastry out of the fridge and manipulate one large ball at a time with your hands to soften - it needs to be the consistency of Play Doh or it will crack when you try to shape it. Once soft, lightly dust your work surface with flour and roll each dough ball into a 20cm circle. Using a small jam jar (about 6.5cm diameter) as a guide, shape the dough until you have a pie shaped pastry case with walls about 8cm in height. Be careful not to push the dough too hard on to the jam jar or it will stick. Use the reserved pastry to patch any holes or tears so that there are none for the jelly to leak through. Divide the filling into quarters, roll into balls and place one inside each pie. Roll out the smaller pastry balls into 9cm circles. Brush the top inner parts of each pie case with egg wash and put the pastry lids on top. Pinch the edges to seal, creating a crimped edge with your thumb and forefinger. Cut two small holes in the top of each, brush with the remaining egg wash, then put uncovered in the fridge overnight. The following day, put the pies on a lined baking tray and bake at 230°C for 15 minutes, then 190°C for 1 hour 15 minutes until golden brown. Remove from the oven and set aside to cool for 30 minutes. Re-cut the holes in the top and pour in the pork jelly - the easiest way to do this is using a squeezy sauce bottle. Chill until the jelly is set. 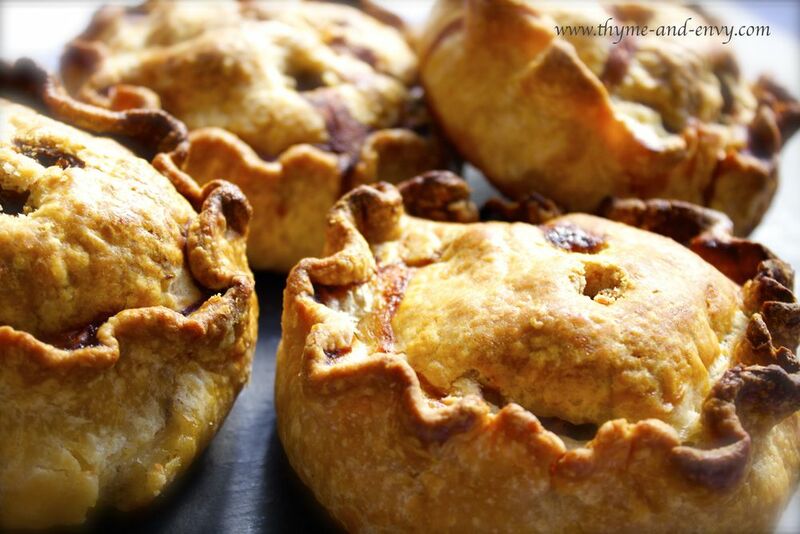 Remove the pies from the fridge an hour before required and serve at room temperature as part of a ploughman’s salad.